The game of xiangqi, also known as Chinese chess, is a chess-like game popular in China, Vietnam, Taiwan, and other East Asian countries. 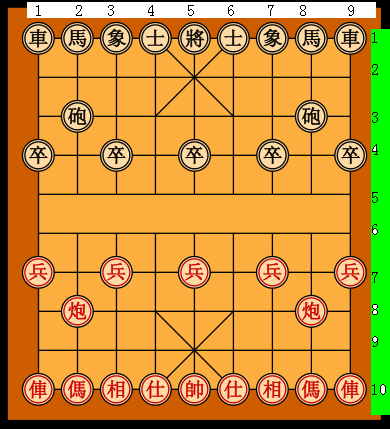 The colours of the two sides in xiangqi are red and black. There are 16 black pieces in xiangqi: the 1 general (G), 2 advisor (A), 2 elephant (E), 2 horse (H), 2 chariot (R), 2 cannon (C), and 5 soldier (S). The vertical lines are known as files (columns), and the horizontal lines are known as ranks (rows). The file numbers are counted from each player's right to each player's left. For black, the file numbers are shown in the picture, white background. In case there are two identical pieces in one file, symbols + (front, higher rank) and - (rear, lower rank) are used instead of former file number. If there are more than two, +(highest rank), 2(2nd highest rank), 3(3rd highest rank), ... is used. It's fine either you use the number or - to mean the lowest rank if more than two exist. If more than one file contain multiple identical pieces, both former file and order can't be omitted, but the piece abbreviation can be omitted. A plus sign(+) is used to indicate forward movement. A minus sign(-) is used to indicate backwards movement. A dot or period(.) or equal sign(=) is used to indicate horizontal or lateral movement. For a piece that moves diagonally, the plus or minus sign is used rather than the period. Thus, if the five soldiers are at (5,6), (7,6), (9,6), (5,8), (7,8), then each of them moving one rank forward are expressed as -5+1, -7+1, S9+1, +5+1, +7+1; two horses at (3,4) and (3,8) each moving to (4,6) are expressed as -H+4 and +H-4; five soldiers are at (5,6), (7,6), (5,4), (5,8), (7,8), then each of them moving one rank forward are expressed as 25+1, -7+1, 35+1, +5+1, +7+1; two horses at (3,4) and (5,8) each moving to (4,6) are expressed as 3H+4 and 5H-4. Given the current position and destination of the piece to move, and a list/set containing all positions of the same kind of pieces, output its expression. Input format is quie flexible. Shortest code win. Browse other questions tagged code-golf chess or ask your own question.